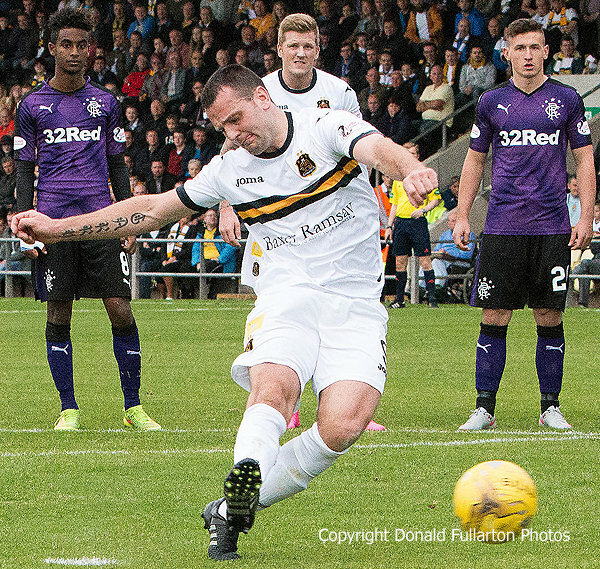 DUMBARTON earned many plaudits but no points as they failed to end Rangers unbeaten run. DUMBARTON earned many plaudits but no points as they failed to end Rangers unbeaten run in front of a 1,978 crowd at the Cheaper Insurance Direct Stadium. Stevie Aitken's men defended resolutely and attacked with vigour, holding out the Ibrox side for over 60 minutes without scoring — the first team to do this so far in the Championship this season — but in the end lost 2-1. Sons were at their best in the first half, and had two great chances to open the scoring after Willie Gibson crosses. But Garry Fleming's header hit the post, while a Darren Barr header was saved by keeper Wes Foderingham. At the other end James Tavernier had a great shot saved by keeper Mark Brown, and hit the post with another effort. After the break Rangers patience finally paid off when Martyn Waghorn netted with an angled shot with the keeper unsighted, then added a second after ref Alan Muir — who struggled throughout to keep up with play — decided a Gregor Buchanan tackle on Kenny Miller merited a red card and a penalty. Just before the end Dumbarton gained a consolation goal when ref Muir saw Frazer Wright downed in the box when he did not even have the ball and awarded a penalty, handing out just a yellow card to the defender. Garry Fleming is pictured netting from the spot.